Is your dog desperately in need of a trim? Petite Tail’s got you covered! We are proud to offer grooming services. I have been grooming dogs for over ten years. 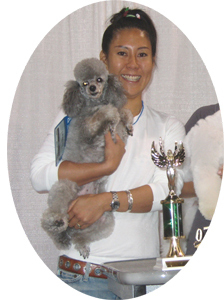 I originally acquired my grooming license in Japan, through the Japanese Kennel Club. The JKC requires those wishing to obtain their licenses to have at least two years worth of participation in the club’s meeting and events, and to reach my level of skill, multiple years of study and practice. In 1998, I placed second in the club-wide grooming competition, which brings together groomers from all over Japan. 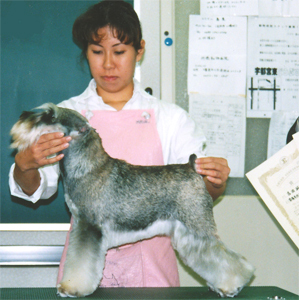 While in Japan, I studied with several renowned groomers, until re-locating to the Los Angeles area. I recently received top honors in the entry level grooming competition at SuperZoo, the industry’s largest trade show. I loves and works with all breeds of dogs. Check out some of our satisfied customers! *I got the prize in the contest for Japanese show dogs. Company Name Triple Gate International, Inc.
Comapny Address 18226 Prairie Avenue, Torrance, CA 90504 U.S.A.